Learn about the Warriors of the Clouds as you discover the remote archeological site of Kuelap, one of the largest ancient stone complexes in the western hemisphere. Having exploded onto the global food scene, Peru is now widely regarded as one of the world’s principal food travel destinations. Lima is home to colorful dishes inspired by the country’s dramatically diverse geography, rich ethnic make-up and long culinary history. Today you set out on a sampling tour to savor some of the flavors that have helped put Peru on the world food map. You’ll explore a local market, traditional bodegas and artisan eateries that collectively showcase some of the best of Peru’s produce, and discover new ingredients and flavor combinations. Learn more about Lima’s trailblazing gastronomic status. Start at the lively market brimming with foods at the core of Peruvian cuisine, including fish, crucial to the classic Peruvian Ceviche; the all-purpose potato, which Peru boasts more than 3,000 varieties; and Andean “super foods” such as cañihua, sacha inchi, maca and kiwicha. You also sample some native fruits such as cherimoya, mamey, and camu. Take time for a Peruvian coffee and head to a local food-haunt such as La Preferida. This particular bodega is in a quiet residential neighborhood and is popular with amongst locals for its variety of classics that you can sample at the bar, including mini causitas, pulpo al olivo, almejas al balsámico, cevichito mixto and choritos a la chalaca served tapas-style. Then, drive to the artsy and bohemian district of Barranco to try home-style criollo Peruvian meals such as pan con pejerrey, papa rellena, lomo saltado, cau con sangrecito, escabeche and estofado. You can also sip on a chilcano, pisco sour or an ice-cold Peruvian craft beer. If you have any room for dessert you can set out to sample some decadent chocolates or sweet Peruvian treats such as picarones and suspiro de limeña. Day 3: Lima / Caral This morning your guide and driver will meet you at your hotel in Lima to drive north along the coastline about three-and-a-half hours to reach the Supe Valley. Before the reign of the mighty Inca Empire, the deserts and arid valleys of northern Peru were home to many innovative, ancient civilizations. The Sacred City of Caral-Supe is the oldest center of civilization in the entire Americas. Located about 124 miles north of Lima, this 5000-year-old, UNESCO World Heritage Site is exceptionally well preserved, sitting on a dry desert terrace overlooking the green valley of the Supe River. Upon arrival, check in to Empedrada Lodge, your base to explore Caral. Enjoy lunch at the lodge before setting out on the half hour drive to Caral. Caral rose from the desert in the late Pre-Ceramic era (circa 3000-2100 BCE), making it the oldest city in the Americas and one of the world’s earliest largest cities. This was a thriving urban city around the same time as Egypt’s ancient Pyramids of Giza were being built constructed… millennia before the Romans constructed the Colosseum or the Khmer Empire erected Angkor Wat. Think of that! Caral is truly remarkable due to its architectural complexity and the impact it had on developing settlements in the Supe Valley and subsequently a large part of the Peruvian coast. Caral is a legacy of the Norte Chico civilization, which was a fully developed socio-political state and the hub of 18 urban settlements in the area that controlled neighboring valleys. 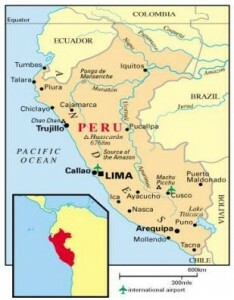 The most highly developed of this conglomeration of city-states, it reflects the rise of civilization in the Americas. As you visit Caral you see its masterful architectural design. Especially notable are striking sunken circular courts, six stone pyramids and earthen platform mounts. Once home to houses, plazas, temples and residences of the elite, the city’s urban plan and some of its elaborate components show clear evidence of ceremonial functions. You learn key aspects of the complex such as its large pyramids, most of which have been at least partially excavated, and grand sunken amphitheater, as well as other smaller buildings. You may also witness ongoing excavation being performed by archaeologists from San Marcos University. Today, you have a private vehicle and guide to explore the Llanganuco Lakes and Cañon Del Pato. Highlights of the Cordillera Blanca are the Llanganuco Lakes, turquoise glacial lakes tucked away in the heart of the Huascarán National Park. The park is surrounded by the majestic mountain peaks of Huascarán, Yanapaccha and Huandoy, offering stunning landscapes. Then head toward Cañon del Pato, which divides the Cordillera Blanca and Cordillera Negra mountain ranges as they nearly come into touching distance of each other. Pass through the Callejón de Huaylas Valley to reach the lakes. Along the way, pause to visit Campo Santo Memorial Hill, to memorialize the town of Yungay, once located here before being wiped out by a devastating avalanche caused by an earthquake in the 1970s. Leaving paved roads behind, you travel into the mountains through agricultural lands and small, rural villages and enter Huascarán National Park. As you drive toward the lakes, continue upwards to the through a dramatic valley calved by glaciers and surrounded by thick forests. Llanganuco is the collective name for two connected lakes, Chinancocha and Orconcocha, at some 3,850 meters/12,631 ft., which are fed by a stream of thawing ice from the snow-capped mountains behind them. A gentle hike through the María Joesfa Forest takes you to the lakes. Small row boats can optionally be rented to go out onto the vibrant, cerulean waters. Follow the shoreline path to Orconcocha Lake, skirted by twisting tree branches of indigenous high Andes polylepsis trees. Explore more of the Cordillera Blanca, choosing between one of the full-day adventures offered by the lodge. You can begin with a hike to gorgeous Laguna 69, with a private vehicle and guide. A high, alpine lake with unbelievably bright blue waters, Laguna 69 sits at an elevation of some 4,650 meters / 15,255 feet and offers a spectacular hike. The picture-perfect lagoon is fed by a gently tumbling waterfall from the melting snow caps that loom over it, with an almost other-worldly backdrop. The path winds its way up through the sublime scenery of the Cebollapampa pastoral valley, passing babbling brooks and grazing cows. This area is home to a great diversity of flora and birds that are unique to the Huascarán National Park. It feels as if the views couldn’t possibly get much better and the occasional plateau and a smaller lake provide much needed opportunities to rest and soak up your surrounds. The last stretch of the hike is definitively the hardest, with a challenging steep incline to reach the brilliant waters of Laguna 69. The vibrant color stands in stark contrast to the rocky scree slopes and soft white snow behind. Later. return along the same trail to meet by private transport to your lodge. Another option is a full day exploration of Pastoruri Glacier, at 5,250 meters / 17,200 feet, is remarkably easy to access, tucked between Andean mountain peaks. The glacier is a dramatic example of the effects of climate change. The glacier is melting quickly and retreating, having lost around 22% of its size and 15.5% of its ice mass in the last 30–35 years. In fact, it is technically no longer considered a glacier since it no longer builds up ice in the winter. This thawing has uncovered dinosaur prints in the rocky landscape. Drive through scenic Andean alpine landscapes to reach the Pastoruri Glacier. Along the way, pause at Patococha Lake and see Puya Raimondi up-close, a plant native to Peru and Bolivia. Coined ‘the Queen of the Andes’, raimondi is the world’s largest specie of bromeliad, reaching up to 15m/49ft in height, and considered endangered. Drive to the glacier to take a hike on walk uphill along a gradually ascending 2km/1.24mi path for around 30-45 minutes. You arrive at a scenic spot close to Patoruri’s imposing cliff-like edges. It is also possible to hire a horse for the distance if you’re feeling the effects of thin air at altitude. For a more off-the-beaten-path adventure, you can take on the challenging hike up to Laguna Churup with a private vehicle and guide. After breakfast, drive to the trail head of Laguna Churup, at 4,450 m / 14,599 ft, on the outskirts of Huaraz city for a challenging hike to this beautiful lake inside the Huascarán National Park. Although the route is relatively short in terms of distance, just 7km / 4.35mi, it is all uphill to reach the lake sitting at the foot of Churup Mountain. The trail climbs upwards and has strategically placed positioned to provide a rest stop and panoramic views over the valley. As you approach the lake, the terrain gets rockier, so you will need to scramble up the rocks for a short stretch using a well-maintained steel cable for support. The path gets rockier still as you need to pull yourself up rocks, using the steel cable to reach the lake. Alternatively, it is possible to skip the adrenaline-inducing need for this additional scrambling and take a longer hiking trail to access the lake via a higher view point. The reward of either trail is the stunning deep blue hues of the lake, reflecting the mountains behind in the crystal-clear waters. Peru’s rich history stretches back thousands of years and traces of its ancient empires still dot the central Andes today. One of the most impressive archaeological sites is Chavín de Huantar, which served as the capital and ceremonial center for one of Peru’s most sophisticated early, pre-Incan cultures, Chavín. A three-hour drive through the Cordillera Blanca Mountains to reach the UNESCO World Heritage Site of Chavín, 3,177 meters / 10,423 feet, to investigate archaeological ruins and a site museum. The complex offers you a look at an outstanding achievement of ancient construction and showcases artifacts and ruins from the Chavín culture, which developed between 1500 and 300 BCE in Peru’s Mid-Late Formative Period. In its heyday it was the center of power for the Chavín civilization, a place of worship and an important pilgrimage site for spiritual rituals. Its strategic location, at the confluence of two rivers, marked an important meeting point between the coast, mountains and jungle. It is one of the earliest and best-known pre-Columbian sites and reveals much about the once-thriving Chavín culture. The ceremonial and cultural nature of the site is evident by its architectural and technological design, comprising terraces, temple-like structure, plazas and agricultural rooms. Most structures visible today were constructed between 900 and 700 BCE. Chavín also has a labyrinthine network of dark underground corridors and chambers where Andean priests undertook mysterious religious ceremonies. Hallucinogens from the native San Pedro cactus were likely used on novices being initiated into the religious cult before entering the underground maze, instilling fear in nonbelievers and affording priests an otherworldly power. An extraordinary feat of engineering, some of these subterranean passageways are lit for you to explore and imagine what this intense initiation process may have felt like. Setting out with your private guide on the path to the waterfall. The walk is on is well-maintained trail and provides a stable and scenic journey and crosses small streams and gorges spanned by short bridges. Some sections have steep inclines, and horses can be hired for part of the journey to the falls. You can also arrange in advance for a horseback ride back if you’ve had enough walking by then. The walk starts through farmland where sugarcane and other crops are grown, before changing to lush cloud forest with jungle-like vegetation. Surrounded by the sounds, sights and smells of the cloud forest, enjoy the beautiful flora and fauna along the way. With your expert guide, explore the pre-Incan Chachapoya civilization, known as the ‘warriors of the clouds’. Kuelap is one of the largest ancient stone complexes in the western hemisphere. It was constructed at 3,000 meters/9,842 feet above sea level on a ridge overlooking the Utcubamba Valley in northern Peru. The imposing site is over 600 meters/1968 feet in length, and its surrounding walls up to 20 meters/66 feet high. Kuelap is commonly described as a fortress, but the complex includes not only military structures but also buildings that suggest religious, civil and domestic use that might have accommodated as estimated 3,000 people at its height. The site encompasses multiple levels within the complex and over 400 constructions, most of which are cylindrical, with some friezes and decorative patterns remaining.